On May 18-30. 2018. Kyiv International Institute of Sociology (KIIS) conducted an all-Ukrainian public opinion poll. 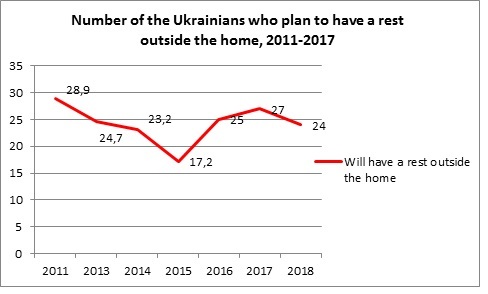 Data were collected from 2025 respondents living in 108 settlements in all oblasts of Ukraine (except for the AR of Crimea) with the method of personal interviewing. The sample was stochastic, and it is representative of the population of Ukraine aged 18 and above. The study showed that as of the second half of May 2018. 64% of the Ukrainians do not plan to have a rest. Compared to 2017. this number has increased (it was 59%). The number of those who have no opportunity to go somewhere is 22% (and it was 24%). A visa-free regime begins to influence the plans of the Ukrainians to go for the rest abroad. This year, 4% of respondents answered this way; this number did not rise above 2% during many previous years. 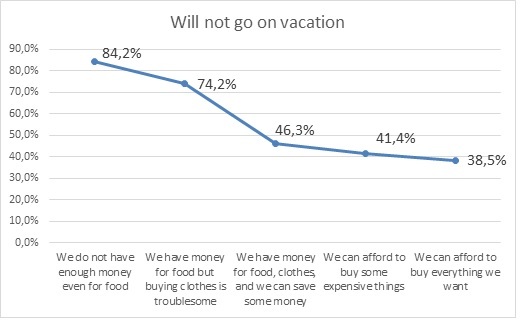 12% of the respondents have not decided yet where to go on vacation. Among men, twice as many of those who plan to travel abroad (5%) than among women (3%). No more significant differences were found. The older is the age, the bigger is the number of those who plan to stay at home for the rest (18-29 years old - 25%, 70+ years – 72%). The same tendency is observed with the opportunities to go somewhere - the older is the age, the greater is the number of those who do not have the opportunity to go somewhere (18-29 years - 22%, 60-69 years - 28%). Representatives of the youngest age group of 18-29 years are most likely to travel to the Carpathians and abroad (14% and 8%, respectively). The biggest amount of those who plan to have a rest in “dachas” is among middle and older-aged people (8-9%) compared to young people (4%). The largest number of those who plan to go abroad is among people with higher education (8%). There are big differences regarding the plans for a vacation among people who reside in different types of settlements - 79% of villagers do not plan to go anywhere, 56% of the city residents responded alike. Among the villagers only 3% plan to travel to the country houses, cottages and villages, among the townspeople they are: 8% - to “dachas”, 5% - in the villages. Those who plan to go to the Carpathians and other places of Ukraine are twice as many among urban residents (10%) compared with the villagers (5%). Ukraine in general,2011 р Ukraine in general, 2013 р. Ukraine in general, 2014 р. Ukraine in general, 2015 р. Ukraine in general, 2016 р. Ukraine in general, 2017 р. Ukraine in general, 2018 р.